Never flush tissues down the drain because they do not break down like toilet paper. Instead, tissues will go on to clog screens at the water treatment plant. Tissue boxes are made out of cardboard, so they can be recycled alongside larger cardboard packages. Find out more. Tissue boxes often contain plastic liners; remove the plastic liners to reduce contamination, and then recycle the empty boxes with cardboard. Consider purchasing a few washable handkerchiefs, so you can use them instead of tissues, which end up in landfills. At the store, look for brands that use a greater percentage of recycled paper in making their tissue paper. Brands that make tissues with 80 percent or more recycled paper include Green Forest, Seventh Generation, 365 (Whole Foods), Natural Value, Earth Friendly and Trader Joe’s. Store loose plastic bags in an empty tissue box, and keep the box under the sink, so you can keep these bags in reach. An empty tissue box is an excellent makeshift collection box for deposits and small bills. Craft it into a deposit box for a bake sale, charity event or tip jar. 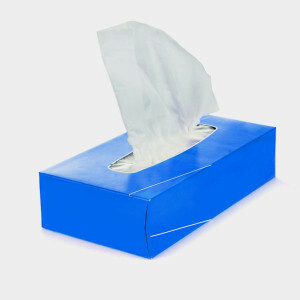 Kleenex facial tissue was invented in 1924, but it wasn’t intended to replace handkerchiefs. Instead, facial tissue was created to remove cold cream. People started using facial tissue to blow their noses on their own.